Following on from Andrew Walter and Marcos Ambrose’s announcement that they had formed a Motorsport Academy several weeks ago we are proud to announce the selected drivers who will represent the Academy in the 2016 Australian Kart Championship. 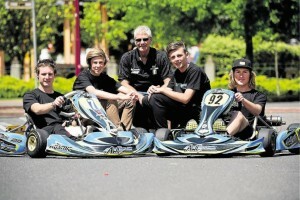 After an extensive selection process four of Tasmanian Karting’s most talented drivers have been chosen to compete at all five rounds of the 2016 AKC (Australian Kart Championship). The team will field two drivers in the ultra-competitive X30 Class. After competing in the series last year Brody Appleby of Devonport will be looking to take yet another step forward and improve on his impressive performances last year. He will jump into an FA Kart for the first time next year but has already begun testing to ensure he’s right to go from the very first lap. Joining him will be Nathan Zuj, who has undoubtedly been the best senior driver in Tasmania for several years. Until now he hasn’t been able to race regularly outside of Tasmania but this opportunity allows him to show the rest of Australia exactly why he has been the yardstick in Tasmanian Karting for so long. Taking a big step up is Launceston driver Jackson Callow who will pilot the teams KA2 entry. Callow has been dominant in both Junior National Light and more recently Junior National Heavy taking home consecutive Tasmanian Closed State Titles. A successful stint recently in Junior Clubman sees Jackson ideally poised to take full advantage of the opportunity next year. Rounding out the team is Lachlan Dalton who will represent the team in the KA4 Class. After a very successful Cadet career Dalton has been in recent times competing in Junior National Light and Junior Clubman. Lachlan’s pace at the recent Tasmanian State Title proved he can mix it with the best and is certainly up for the challenge next year. When speaking about the team’s chances next year Andrew Walter said “Whilst this will be a learning year for our team I am certain the drivers we have picked will acquit themselves very well, and we are very keen to bring home some good results. There will certainly be no excuses when it comes to equipment as we believe aligning with FA Karts and James Sera Karting Centre will provide us with the right tools to do the job”. “It’s also great that Tasmanian entities like SRT Logistics and Motorsports Tasmania have realised what we’re trying to achieve here and have come on board to support our program”. Marcos Ambrose will be taking on more of a mentoring role within the group and hopes to share the knowledge he has accrued from over 25 years of competitive motorsport at the highest level. “Honestly I just can’t wait to get these kids out on the track and start testing, we’ve picked some real hard chargers here and we’re going to have some fun next year and give this championship a red hot go” Ambrose said. The team will now turn it’s attentions to pre-season testing and preparing for the first round of the series at Dubbo starting on the 5th of February. The team would also like to thank both Motorsports Tasmania and SRT Logistics for their support and are also looking forward to announcing some more sponsors soon.